I’ve had the Sony DPT-RP1 for six weeks now and I’m still amazed every time I pick it up by how thin and light it is—the device has such a unique feel to it—and the large 13.3-inch E Ink screen has an addicting quality that makes you want to use it all the time. The software on the Sony DPT-RP1 still needs some improving to add more features, but the hardware is outstanding. 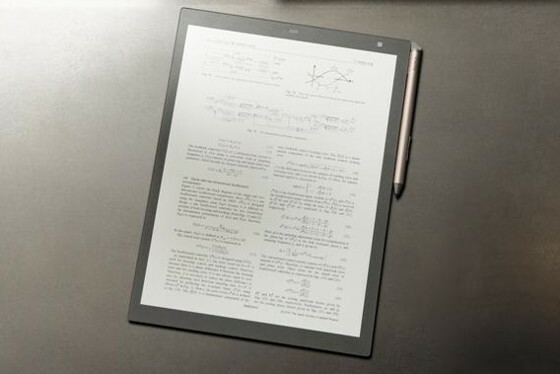 The quad-core processor is zippier than typical processors used with E Ink, and writing with the stylus feels surprisingly similar to writing on real paper. One key to the lightweight design is the flexible plastic-based E Ink screen. Normally E Ink screens use glass backplanes that are heavier and can easily crack. Often plastic is considered cheaper and inferior to glass, but not when it comes to E Ink screens. Plastic is the way of the future. It weighs much less than glass and is virtually shatterproof. Hopefully someday soon smaller ereaders will start using similar hardware components as the Sony DPT-RP1. Now every time I pick up the Kobo Aura One I wish it was more like the Sony. It has a similar feel of thinness (it’s only 1mm thicker) but the glass screen adds a lot of extra weight. A 6-inch model with the a plastic-based screen would probably weigh less than 100 grams, or about half that of the current Kindle Paperwhite, and the flexible screen would help make it more durable. Sony is known for being a pioneer in the field of E Ink readers. Perhaps the Sony DPT-RP1 is a glimpse at what mainstream ereaders will be like in a few years. Super lightweight, much faster, more durable. One downside of a plastic screen is that they tend to scratch more easily than (better quality) glass ones. My Kepler Pro apparently has Asahi Dragontrail (roughly equivalent to Corning’s Gorilla Glass) screen, and I’m beginning to notice how scratch-free that keeps it. Dragontrail front + alloy back does make the K-Pro a bit heavier than some of its competitors, but it does make for a very slim-but-solid (and thus portable) device. Sony makes the best products but they don’t know how to market and distribute them. Still not any announcement if this device will come to Europe. The (near) future of ereaders, I hope, is a combination of plastic screen, pen support, open Android or Linux software, weatherproof casing, and a variety of sizes. I really hope at least some eReaders will never have open software or styluses or apps etc. I like that my eReader does one thing well. I have a phone for the other stuff. I just want to tread a book in peace. I don’t want to interact with a device , get notifications or have to do anything except have access to books and read them. Nathan — I think plastic screens is the future of e-readers. Like someone said plastic scratches easier, but the weight advantage far, far outweighs this. Maak: open software means that you have a choice of reading software, sync method, file manager, etc. That I find to be an advantage. On the ‘weight advantage’ of plastic over glass, I suspect that would be far more pronounced on larger readers like the DPT-RP1 than in smaller ones. There is also the possibility of hybridization — a plastic substrate for weight and robustness and a strengthened glass layer on top for scratch-resistance. I don’t get this scratching business. First off, how can you possibly know that plastic E Ink screens are more prone to scratches than glass, especially considering most have light layers going over the top anyway. Second, I’ve never once had an issue with E Ink getting scratches and don’t put ereaders in a position to get scratched. Seems like a lot to do about nothing to me. 1) I think it’s rather doubtful that a manufacturer would go to the trouble of putting a layer of strengthened glass on an eReader, phone or tablet, and *not* put it as the outermost layer. 2) It isn’t just big, obvious scratches and abrasives. Even dust can scratch a screen, if it contains particles of something harder than it. The damage from a single dust-scratch wouldn’t be noticeable, but dust is ubiquitous, and the the damage would build up over time, impairing the the surface. Plastic is a lot softer than glass, so a lot more easily abraded. That’s my point exactly. Lots of ereaders like the Kindle Paperwhite have a light layer over the top of the screen with no strengthened glass and you almost never hear of anyone having a problem with scratches. Using a sharp pointy felt or POM tip stylus on the DPT-RP1 doesn’t leave the slightest hint of scratches on the plastic-based​ screen either, so why make it out as a negative when it’s not even a common problem? Glass screens cracking is a much bigger issue than scratching. Thanks for sharing. It’s funny how Sony were basically out of it with their unsupported DPT-S1, and now they’re back big time. Any advances on using the RP1 as a 2nd monitor? That’s a big one for me. You can do it using the android hack but that probably won’t be released since it was Chinese people who did it and they never release the details so that they can make money. Official support for that I think has not a chance in hell. Best shot is for a western hacker to also figure out the Android hack. Maak: The problem is that DPT-RP1 is even not good at that one thing while it lacks every other thing. If the factory software was perfect for reading experience, I would not desire any open software. J you hit the nail right on the head.